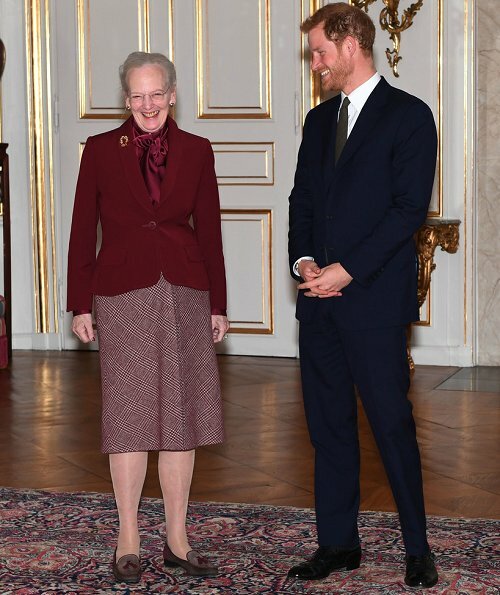 On October 25, 2017, Queen Margrethe II met with Prince Harry at the Amalienborg Palace in Copenhagen, Denmark. 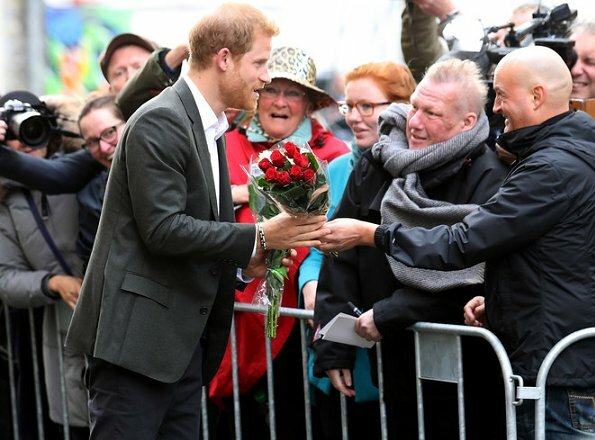 Prince Harry attended an audience with Denmark's Queen Margrethe today at the start of a two-day official visit to Copenhagen. (Prince William, the Duke of Cambridge, is to make a two-day trip to Finland next month and will visit Norway and Sweden early next year with the Duchess of Cambridge). Looks like they had fun. Nice! I like Harry's deep blue suit. He looks very elegant. And a good color with his red hair. The Queen has no dress sense, however, it appears that most Swedes think she is superior to everyone else. ??? Why would just Swedish people think that about Danish queen? Maybe not a good call, It seems that harry wasn't bothered. He lightens up anyone's day. well, the 80's are back indeed, I think I had this jacket and blouse when I was in grad school. Hello Prince Harry! What's Sweden got to do with this? 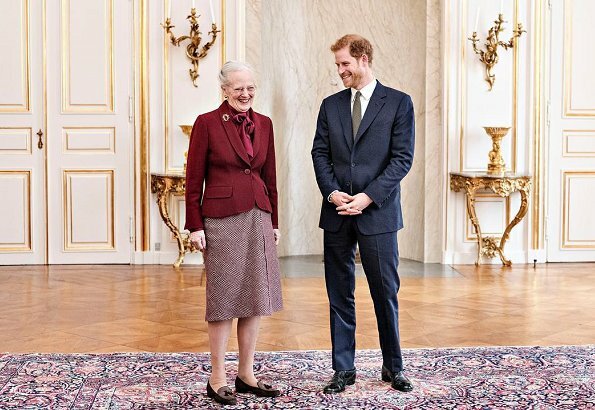 Queen Margrethe is danish and I don't think she doesn't have a dress sense but rather have a quirky if not outlandish dress sense. But in this instance, she looked just right. Prince Harry has his mother's charisma. This is actually one of the times that queen Margrethe looks nice. Well matching pieces, but still staying true to herself. I think I need to get a dark blue suit like Harry's for my hubby, looks great! He 8ndeed has his mother's charisma and ability to connect with the people he meets. He looks a lot like his grandfather Prince Philip in the first photo! Agree, he has big resemblanche with Prince Philip. Only hair is different. 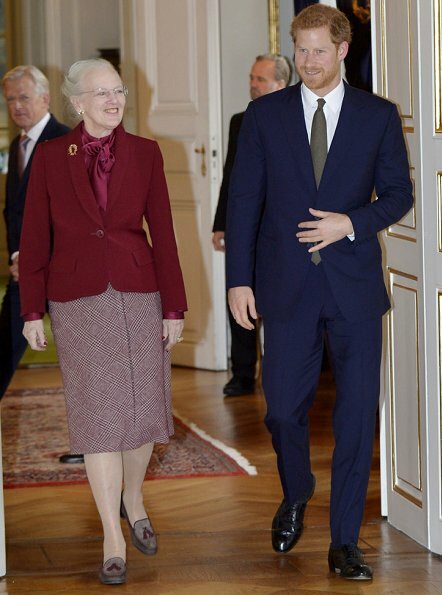 Prince Harry is gorgeous and it seems his charm is not lost on Queen Margrethe. Nothing wrong with the outfit of the Queen. It is suitable for the occasion and for her. She actually looks very elegant in this outfit. She is always very friendly and I haven't seen any superior attitude from her. Please she is Danish and thank God not Swedish.